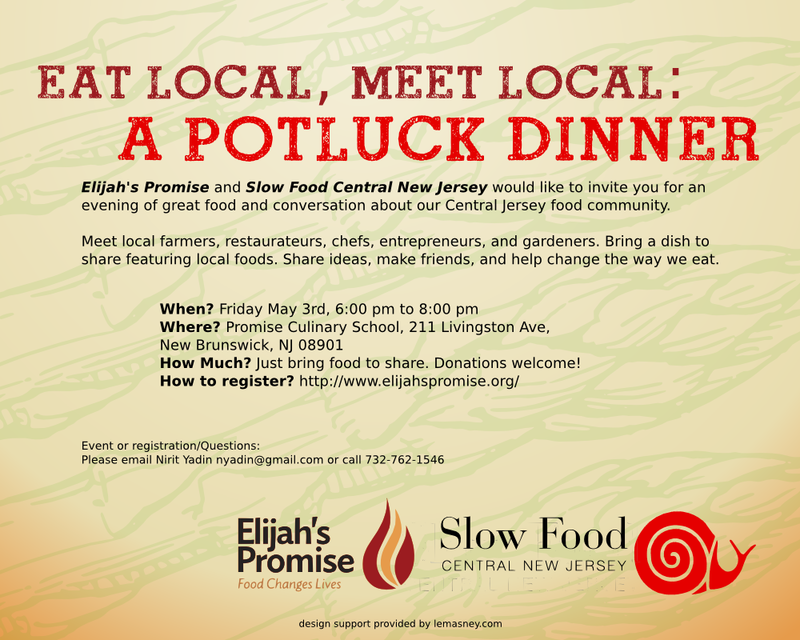 Slow Food Central New Jersey and Elijah’s Promise of New Brunswick are holding their second annual Eat Local Meet Local potluck dinner on Friday, May 3, with the goal of bringing together people from all walks of life to share a meal of delicious, local food. “This is a great way for people to come together to network, learn from one another and work together to build a healthier, stronger food community for all!” says Lisanne Finston, Elijah’s Promise’s Executive Director. Participants are encouraged to bring a dish made of local food (if possible). In addition there will be food from local businesses and farms such as Promise Culinary School,Beechtree Farm, Tre Piani Restaurant, George Street Co-op, Tula Restaurant and Lounge, Pitspone Farm, Great Road Farm, Griggstown Farm Market, OQ Coffee and more. The event will take place on Friday, May 3 from 6:00-8:00 pm at Promise Culinary School. Food will be served buffet-style and there will be informal discussion groups about food, sustainability and food justice. Come, meet new people, enjoy great food and help change the way we eat. Promise Culinary School, 211 Livingston Ave, New Brunswick. Free, bring a dish to share. Donations are welcome. Questions: please email nyadin@gmail.com or call 732-762-1546.